This weird little mask has gained cult following ever since Drew Barrymore dropped the zombie shot on her Instagram. It's weird, and you know there are very few things that bring me more joy than a weird face mask. I don't really care what it does (as long as it doesn't make anything worse, I'm in it for the experience) but this one was a little intimidating. It makes a lot of promises, big ones. I can't even summarize the claims because my brain can't wrap around them all, so I'm just going to cut and paste them below from their website. It is currently in stock but they can't keep them on the shelves. Here's what I can say, they claim to do everything from detox pores to combat aging. It's just bananas. So much science and fancy ingredients. Such a strange application process. Only a video will do here. You can watch it below these super close pictures of my face. Top, two days after application. 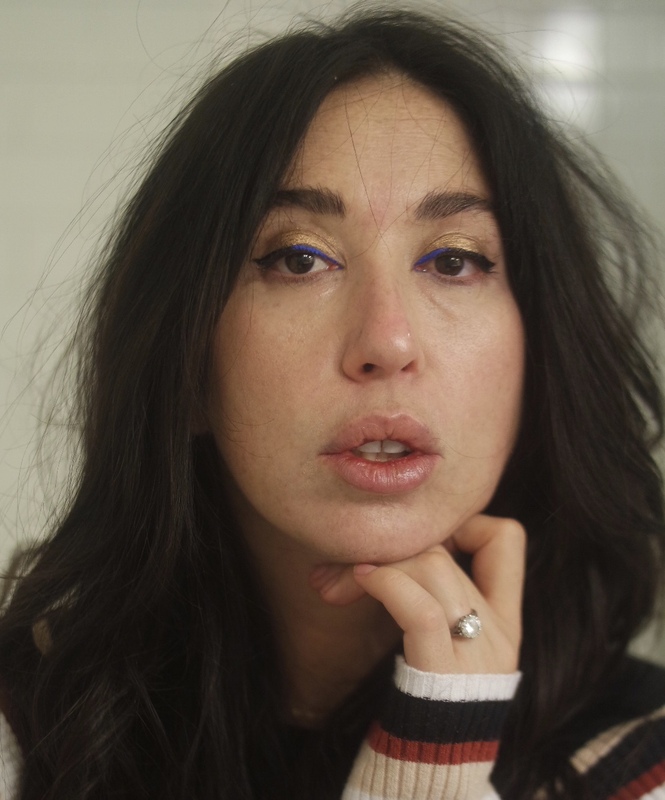 Above, super close, unretouched image of face with bathroom lighting, and minimal makeup. Immediately after mask. Mask Application. Feels as weird as it looks. The Lifting Serum is mixed with the Gelling Solution to create a Purifying Compound that absorbs and discharges all impurities deep in your pores. The Purifying Compound fuses with carbon dioxide in the air with our CO2 OctoLift™ technology and creates a strong binding force that produces the lifting and firming effects on your skin. Within 30 minutes, powerful botanical extracts are released to soothe and calm problematic skin while peptides work to target all other signs of aging, revealing a noticeably improved complexion, time after time. WHY IS THIS BETTER THAN OTHER MASKS, INJECTIONS, LASER TREATMENTS, OR FACIALS? 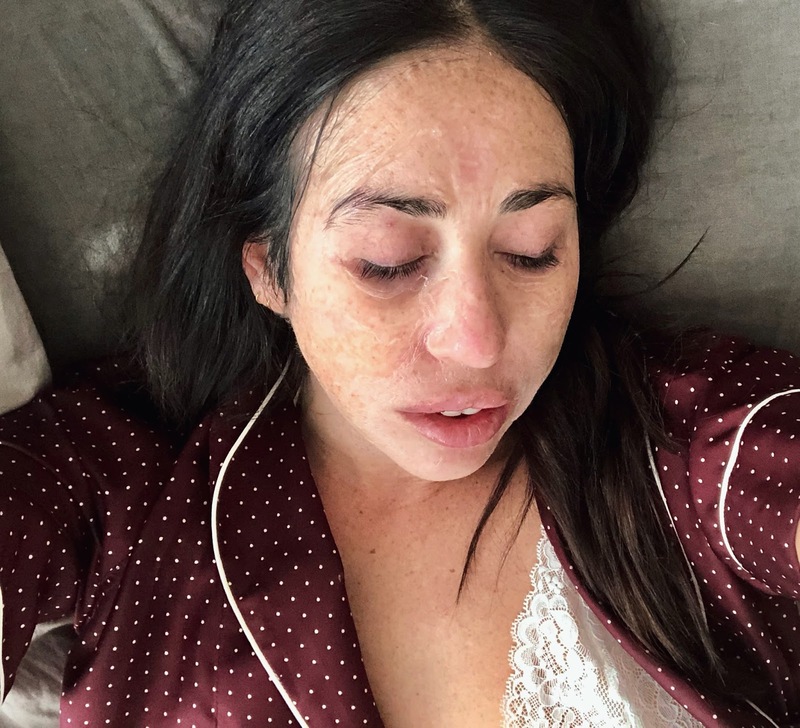 The problem with the skin care industry is that injections are invasive, laser treatments are expensive (which usually only target 1 or 2 problems), and there are hundreds of products that make false claims. Hanacure simplifies the process in addressing all major skin concerns with just one product. There is no other product on the market that shows signs of improvement within 30 minutes and continues to transform with every use. CO2 OctoLift™ is the reaction that takes place when the Purifying Compound fuses with CO2 in the air to create a strong binding force that produces the lifting and tightening effects on your face. When fanning your skin, the intensity of the tightness will increase. This helps with fighting signs of aging while the Purifying Compound absorbs the impurities and discharges it from your skin. WHAT IS THE PURIFYING COMPOUND? The Purifying Compound is made when the Lifting Serum is mixed with the Gelling Solution. In its liquid state, it seeps deep into your pores and begins to react with the CO2 in the air (see CO2 OctoLift™) for lifting and tightening effects. As it resolidifies after fusing with CO2, the Purifying Compound absorbs all the impurities from your skin to be discharged when rinsed. WHO IS THIS MADE FOR? DOES THIS WORK FOR ALL TYPES OF SKIN? Hanacure was designed for all skin types at all ages. We believe steps taken for anti-aging should begin at any age. Everyone deserves a chance at achieving flawless looking skin. Please consult your physician if you are pregnant or nursing before use. Each Lifting Serum is paired with a Gelling Solution. Pour Lifting Serum into Gelling Solution, shake well for 20 seconds for Purifying Compound to form and apply it evenly on face, neck, hands with brush. Can use sparingly under eyes but avoid direct contact with eyes, lids, and lips. Rinse thoroughly with warm water after about 30 minutes. For more detailed information and photos, please refer to HOW TO USE. We generally recommend using the mask 2 times per week until you achieve your desired results. After that, a few times per month or any time your skin needs a quick pick me up. The participants in our clinical studies on the Science page were instructed to use our product once every three days for 31 days. However, everyone’s skin reacts differently and results do vary from person to person. Some were able to see dramatic results within just 1 application in 30 minutes, others with more certain skin concerns saw results within a few uses, others with aggressive skin concerns saw improvement after 8-10 uses. Similar to exercise, the results are cumulative. You can also view our second Instagram account to see other people's experiences. We recommend once or twice per week but you may use as often as desired. The results are cumulative so with dedicated use, you will notice even better results. Once your skin has completely transformed after several months, you may use less often (once or twice per month) for maintenance or right before an event to look camera ready. CAN I USE THE MASK AFTER CO2 LASER, CHEMICAL PEELS, OR RETINOIDS? Laser treatments, peels, and retinoids all require the skin to go through a 1-2 week healing process. The All-In-One Facial is an active treatment with intense tightening and lifting effects, so please wait for your skin to fully recover from those treatments prior to using our mask. Please consult your dermatologist with any concerns. WHY AM I RED AFTER USING THIS? Due to the different levels of melanin in our skin, it’s common for people with fair and sensitive skin to experience redness. Don’t worry, it’s only temporary and will subside within 2 hours. Reason for this, is improvement of blood circulation as CO2 OctoLift™ and peptides work to begin skin regeneration. DOES THIS CAUSE ALLERGIC REACTIONS? Our product is hypoallergenic, we do not use any ingredients that are known to cause any allergic reactions, as confirmed with third party labs for safety standard testing. However, please consult a physician if you notice any irregularities for over 2 hours. Studies found that with dedicated use (1-2 times per week) for 2-3 months, the results can last for several months. Results may vary due to the severity of the skin concern. CAN I USE THIS WHILE PREGNANT OR NURSING? In general, the mask is safe to use while pregnant and nursing. However, since pregnancy can influence how one's skin reacts, please consult with your physician. 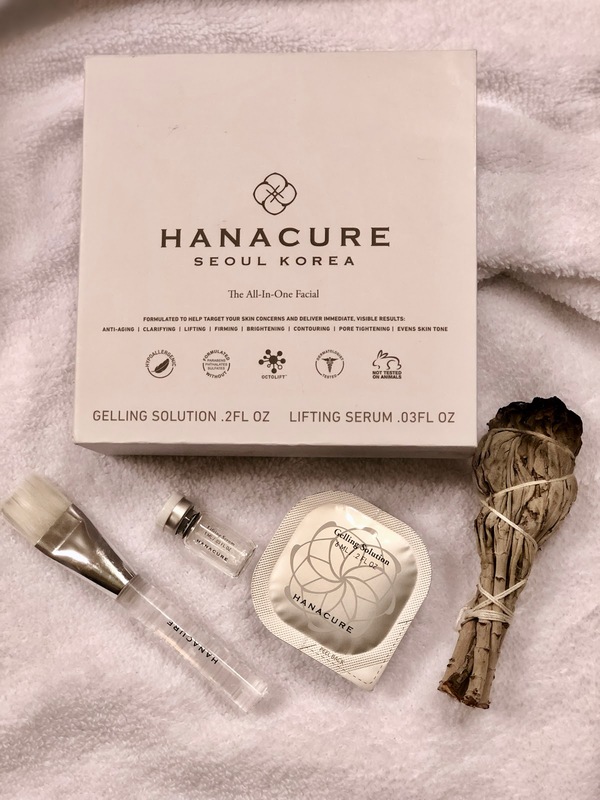 The active ingredients consist of peptides and botanicals, and can be found at https://www.hanacure.com/products/the-all-in-one-facial-starter under the "Ingredients" tab.